Michigan State University Spartans work to advance the common good withuncommon will. East Lansing, Michigan, is centrally located just minutes away from the capital city of Lansing. Known as one of the friendliest cities and best college towns in America, East Lansing features easy access to the beaches of Lake Michigan and the cities of Detroit and Chicago. A vibrant arts culture and myriad shops, boutiques, and dining options help make East Lansing popular with students, residents, and tourists. Type of SCHOOL: Founded in 1855 as the nation’s pioneer land-grant institution, Michigan State is a public, coeducational, residential university that is also one of the top 100 research institutions in the world. International Student Services: Michigan State features a vast array of services to aid international students, including the English Language Center, the Office for International Students and Scholars, and the International Studies and Programs office. Additionally, MSU has dozens of international student clubs and organizations on campus. Financial Aid: International students are eligible for several scholarship awards, including the Global Neighbors Scholarship, Global Spartan Scholarship Award, and scholarships awarded by the Honors College at Michigan State. Athletic scholarships are also available. Test Score Requirements: Students must meet a language proficiency requirement. Students with acceptable academic credentials who do not meet language proficiency requirements may be admitted on a provisional status. For regular admission, a TOEFL score of 79 with no subscore below 17 (internet based), an SAT Critical Reading score of 480 or higher, or an ACT English score of 18 or higher is required. MSU’s TOEFL code is 1465. For other acceptable exams, visit admissions.msu.edu/apply/international. Application Deadlines and Fees: Students are encouraged to apply by November 1 for maximum scholarship consideration. The application fee for international students is $75. Together we tackle some of the world’s toughest problems to find solutions that make life better. 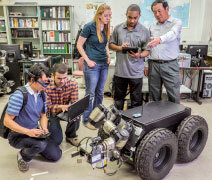 Michigan State is one of the top research universities inthe world—on one of the biggest,greenest campuses in the nation—and is home to a diverse communityof dedicated students and scholars, athletes and artists, scientists and leaders. Home to more than 200 areas of study in 17 degree-granting colleges, MSU is the place to explore and experiment. Students can selectfrom many top-ranked disciplines,including highly ranked programs in Business, Education, Engineering, Management, and VeterinaryMedicine. In fact, MSU is home tothree on-campus medical schools,graduating allopathic (MD) and osteopathic (DO) physicians as well as veterinarians. Students who are part of the Honors College at Michigan State join one of the oldest and most prestigious honors colleges in the nation.The Honors College at MSU allows students the flexibility to design their own programs of study and offers numerous other benefits such as priority enrollment and honorshousing. MSU’s residential colleges offer the best of both worlds: a small-college environment at a Big Ten researchuniversity. Students can study topics such as public policy, natural science, and the arts and humanities while living and learning alongside students with similar interests. MSU’s campus is home to a vibrant and diverse community of undergraduate and graduate students as well as renowned scholars and scientists from around the globe. It is a hub for international programs, centers, events, and worldwide partnerships. At MSU, students are encouraged to learn from and have an impact on the world around them. Michigan State is a top public university in the United States for study abroad, with 275 programs in 60 countries and on all seven continents. MSU offers more than 65 programsfocused on international topics, including language study, specializations in world regions or global themes, and international relations. Once you experience MSU with yourown two feet, you’ll understand why Spartans continue to think of the University as home long after they leave. 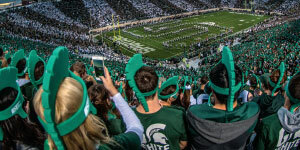 Home to botanical gardens, art museums, performance venues, Big Ten athletics, and recreational sports facilities, MSU puts you at the center of all the action. Among the top 10 best college cities in the nation, according to Forbes, East Lansing is a safe and secure complement to campus thatfeatures a vibrant downtown area with shops, boutiques, restaurants,art galleries, and lots of entertainment options.